Alter playback speed of audio and video files. Is there a better alternative to AudioSpeed? Is AudioSpeed really the best app in Audio category? Will AudioSpeed work good on macOS 10.13.4? AudioSpeed allows you to alter the playback speed of audio (and video) files, and independently or in addition alter the pitch rate. Ideal for learning tricky passages of music or vocals, as it will adjust the playback speed without altering the pitch, if you don't adjust the pitch slider. 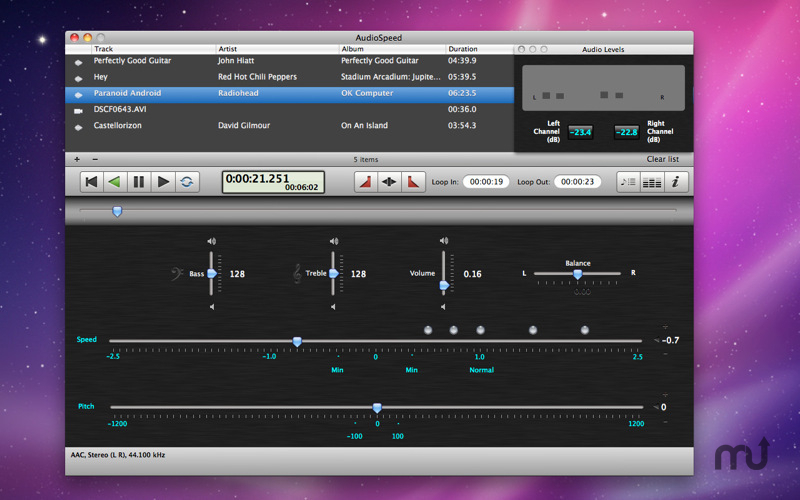 AudioSpeed has a large range of features, allowing you to adjust the playback speed and pitch exactly as you want, and to specify a loop section to repeatedly hear the adjusted audio. Drag and drop table for adding audio and video files. AudioSpeed needs a rating. Be the first to rate this app and get the discussion started! Pitch slider for adjusting the playback pitch rate. Loop buttons for setting the loop start and end points, useful for repeatedly playing a section of audio at a different speed. Unobtrusive step buttons for incrementally adjusting the audio speed and/or pitch rate. Separate level indicator and audio info panels. Keyboard shortcuts for adjusting the speed, altering the pitch by semitones, and skipping forward or back. High quality interface for ease of use.